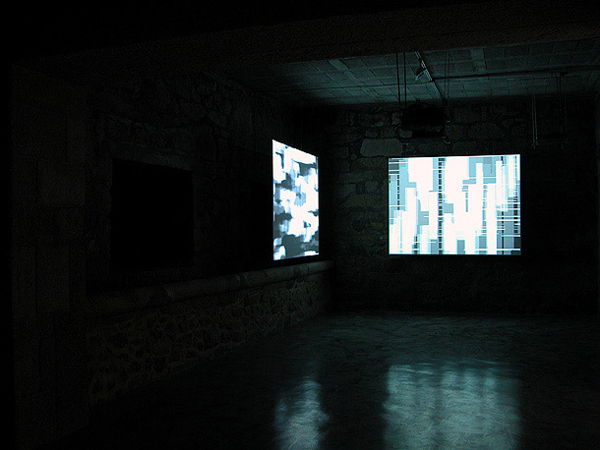 Multiple audiovisual pieces with the fixed duration of one minute are distributed in 5 series over a total of 15 screens, confronting each other and the whole of the composition. 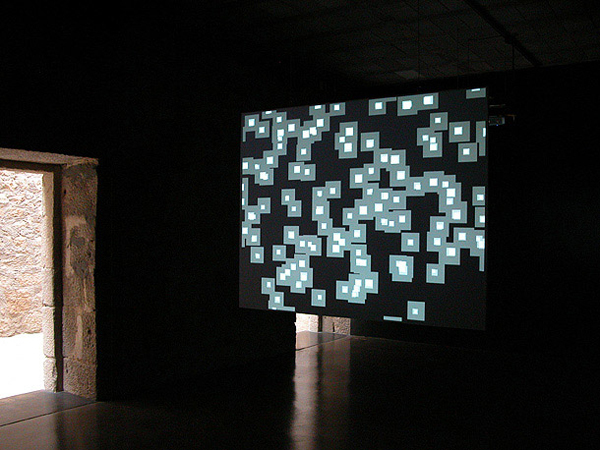 Each series is visually affixed to the various spaces where it is projected, well defined areas inside the gallery, supports from where light emanates or from where it is reflected, but each series is developed visually and audibly throughout the entire space of the gallery because if often the spectator’s field of vision embraces more than one screen, the sound – always radiating – scatters through all the surrounding area of each screen. 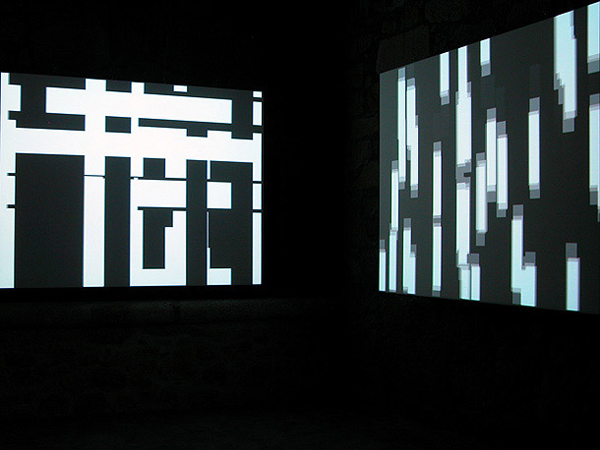 Although the installation is composed by pre-determined, pre-recorded pieces, the sequence of the composition is both structurally and rhythmically open: the order in which the pieces of each series are presented and the final composition that outcomes from that audiovisual flow are indeterminate, defined at each moment by the randomization in the DVD players and by the secondary influence that the mechanical characteristics of each player will have on the pauses between tracks and on the subsequent shift in the synchrony between the reproduction of the different series. Each of the series is gathered in a separate DVD disc and the collection of tracks is played back randomly. There is no programmed control of the randomization and therefore each piece can be reproduced sequentially not regarding whereas the entire series is completed. 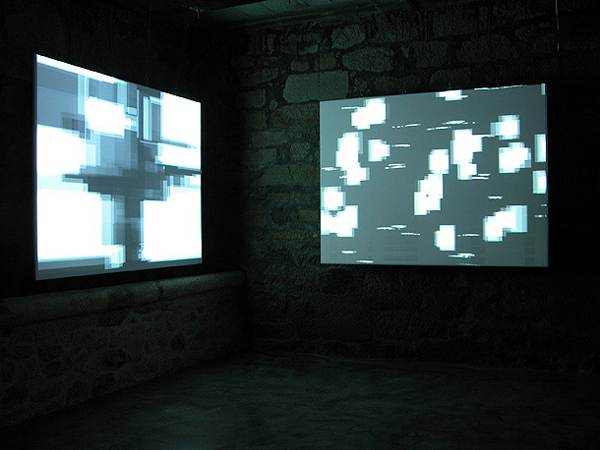 Two alternative visual pieces were composed for each of the sound pieces, thus slightly reducing the probability of consecutively reproducing the exact same audiovisual pair, but never really eliminating this possibility. It is actually desirable that such events can happen in a project of this nature. 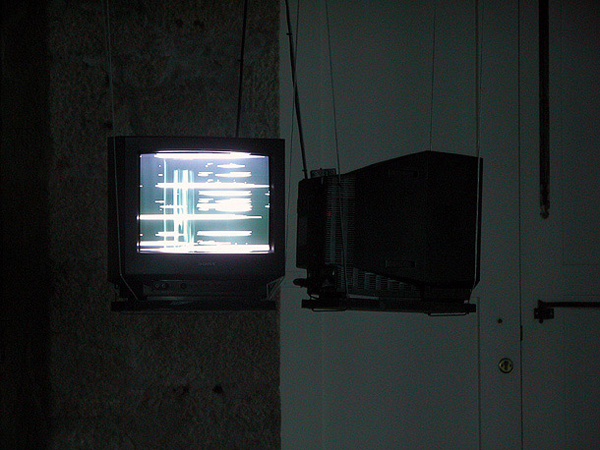 Both the repetition and the loop are elements that are read differently in the visual or in the audible domains and, as the structure of this piece is built upon the (non linear) repetition of elements, producing multiple videos for each audio piece allows us to increase the complexity of the possible visual sequences – once that it is in the domain of the visual where we are more sensitive to the loop. Even if the number of pieces in each series would be significantly lower – and the original plans envisaged roughly half of the total number of pieces that were actually produced – the outcome of the randomization is not, per se, the composition. 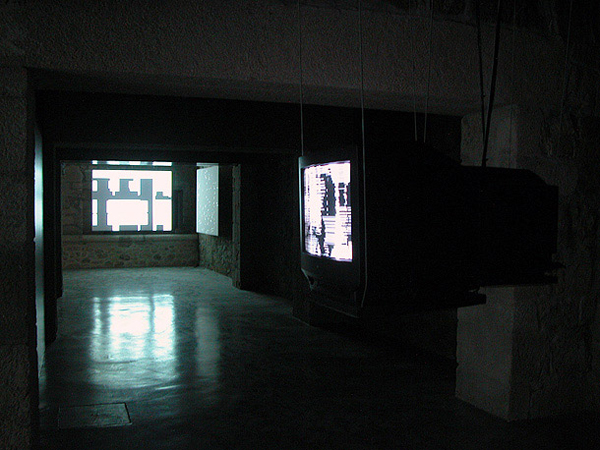 As this is distributed through a complex space, subdivided in different rooms, the path of the visitor trough that space is, in itself, a fundamental compositional factor, therefore, also determinant to the shaping of the piece is read is the reader herself, the visitor strolling through the gallery. When experiencing each of the pieces we propose a search for the synchronous moments, not always obvious or immediately understandable but always existent. The software programmed for the creation of the videos analysed every frame of the audio and interpolated for each video frame the maximum amplitude of the sound, using these values as the mathematical base of variation integrated in the system. Naturally, the audio has a far greater spatial expansion, although it is as amplified as the video (or even significantly less in some cases). 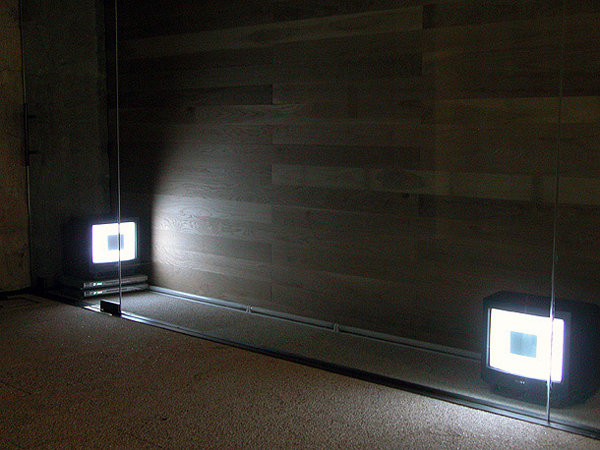 Its diffuse, one-dimensional and immaterial nature allows different sound sources to cross and mix to a level impossible to achieve with video. 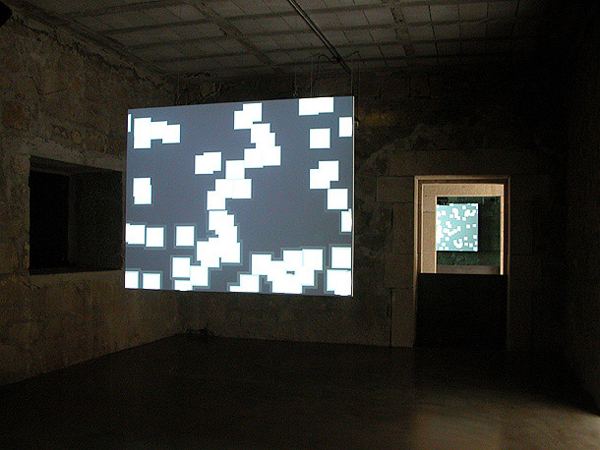 Therefore, the reading of each audiovisual piece (even if the spectator’s field of vision is not reaching further than a single screen) is inevitably infected by the adjacent sounds that can never be heard on their own, whereas the visualization of individual video pieces is in fact possible. The multiple pieces have equally multiple minute variations in the algorithms used for their generation; the shared programmatic roots make them exhibit multiple audio-visual affinities, diversity traits that connect all the individual components of 30×1. 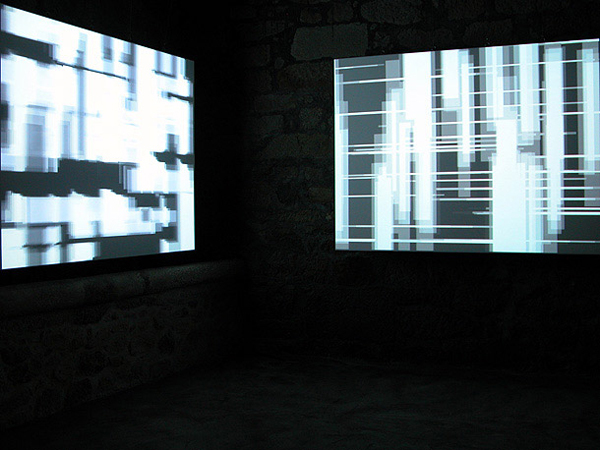 Digital Ontology; at a given moment a relation of parity is established between the sound elements and the visual elements that compose this piece. Independently of their origin, at a given moment, the base code of both elements’ representation is the same, identical, undifferentiated, and infinitely accessible and scrutinizable. In that moment, that place, those elements are information, closely related and parameterized, in continuous dialogue, emerging as an audiovisual unit, points of light and sound exquisitely intertwined, sharing the same digital ontology. Audioimage; here we speak of a possibility, something that will happen outside of the screen, even outside of the physical space where the piece is set, something external to the very elements that compose it, something that when happening, will do so in the mental space of whoever is perceiving. This phenomenon of audiovisual synthesis, this indissociable entity that gains substance in the audioimage is thus found to be a purely mental construct. 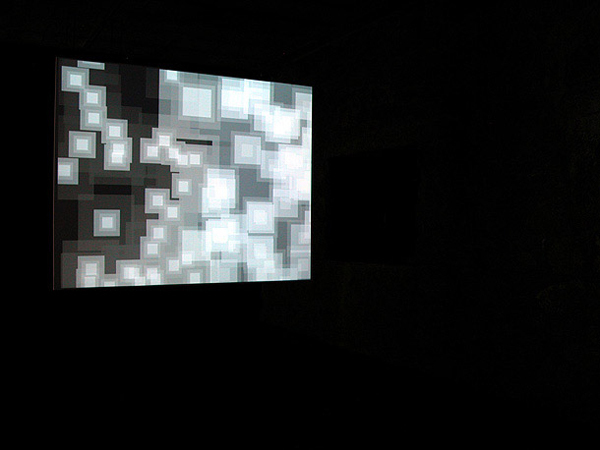 30×1; audiovisual composition, spatial, temporal, evolutional and mutant, built from audiovisual blocks with the fixed duration of 1 minute (1.500 PAL video frames, 2.646.000 PCM audio frames at 44.1 KHz / 16 bit), organized in 5 series, 1, 2, 3, and 4, plus one, 0, of introduction and conclusion, and randomly reproduced by 15 DVD players in 15 screens. The Audio-Vision and Visual-Audition; what is driving what in this piece? Is sound strengthening the image? Is image empowering sound? In most of the “audio-visible” circumstances, the image builds the conscientious nucleus of attention and sound constantly brings along a series of effects, feelings and significances that through a phenomenon of projection are attributable to the image and seem to “naturally” stem from it. On the other hand, the definition of visual-audition is proposed in circumstances where the perception is consciously focused over the audible and upon which the visual context applies a deep influence, empowering or deforming its perception. It is clear that reality proposes an infinitely vast array of combinations in the space between these two forms of perception, where the primacy of one or the other sense oscillates indefinitely. 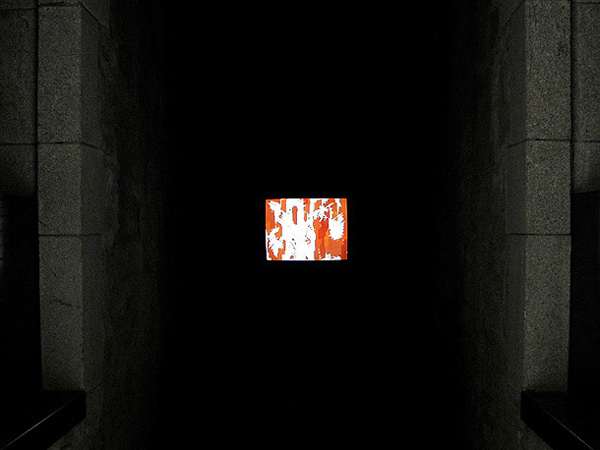 This piece seems to search to establish an objective balance between the elements, perhaps fed by the idea that the perception of a moment where sound and image somehow relate towards the creation of meaning is far from being split among both, always prevailing the mutual influence and a chain of significances that successively seem to emanate from their amalgamation. Synchresis; synchronism and synthesis, a spontaneous psychophysiological phenomenon dependent from our nervous and muscular connections. Widely explored in this piece, admirably in the constellations of small scintillating squares, it consists on perceiving the combination of single auditory and visual events in the instant when both are simultaneously produced as a single event. The phenomenon, literally uncontrollable, leads to the instantaneous building of a close relationship of interdependence between sounds and images, referring both to a common origin, regardless of their individual sources, of their shapes and their origins or nature, individual and specific. Pure geometric shapes are constellations, torrents, eruptions, matter, movement, speed, thrust, organic sounds and synthetic sounds. Organic sounds and synthetic sounds are pure geometric shapes in motion, speed, thrust, constellations, torrents, eruptions and vibration. Michel Chion; audioimage, audiovision and visual-audition, synchresis, extension and temporalization are ideas proposed by the French theoretician, professor, composer and director Michel Chion, in a series of works that culminate in the book L’audio-vision (1990) in which he unpretentiously (in the words of Claudia Gorbman) suggests new ways of thinking about the structures and effects of the audiovisual experience. The Extension; the “audiovisual condition” as a result from the combined sounds and images does not presuppose, a posteriori, their differentiated perception. Sounds and images, when combined, are perceived as space-time organization, as matter and meaning. The audiovisual combine as “cause” produces a determined number of “effects” that are generated by sounds and images in an audiovisual context and therefore, effects of audiovisual inception. 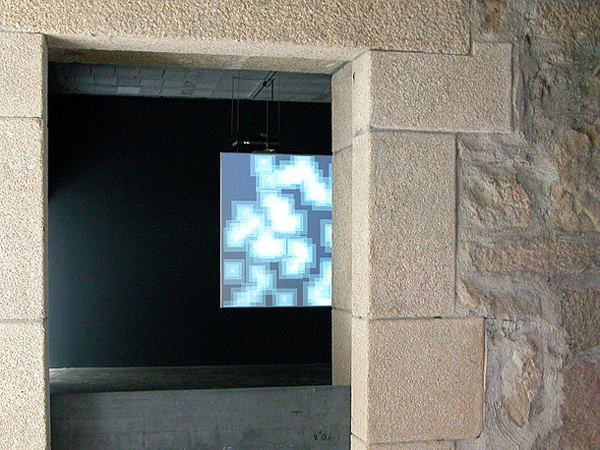 The Extension is an audiovisual effect that is related with the construction of space through the combination of sounds and images. It usually defines a concrete space from which the extension operates, having a restrictive nature when only the sounds produced at that specific space are heard, or a broader nature as more and more sounds from adjacent spaces are included, and broader still when the sounds from spaces further away or even distant sounds are brought together. The spatial extension of the viewer’s field, the introduction of the super-field operated by the auditive contexture strategically operated in the spatial complexity is affirmed in this piece as a fundamental element for the construction of its aesthetic experience. Temporalization and points of Synchronization; the way the sound/image connection models are established and the distribution of the so called points of synchronization are important elements for the “temporalization” of the images and, obviously, to visually underline the temporal character of the sounds. The activation of an image depends on the way in which the sound introduces points of synchrony and the way that the management of expectations from the spectators in relation to the situations where the synchrony is verified is developed. A synch point is a “salient” moment in an audiovisual sequence, the moment during which a sound event and a visual event are joined in synchrony. 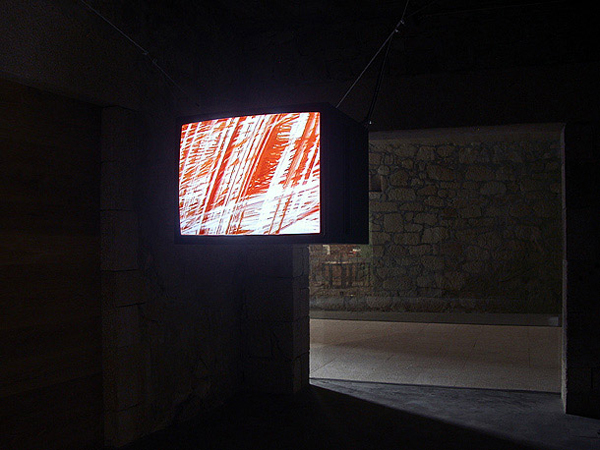 These moments of meaningful encounter, between sound and image, are a pledge of the relative autonomy of the flow of images and sounds, which run parallel to the audiovisual space-time. The control of that flow, of its encounters, dis-encounters and overlays build the pungent nature of 30×1, a conjunction of moments of contemplative pure abstraction with points of a cutting materiality that place the viewer in a constant state of afterimage.